Dunlop has launched a range of three new easy-to-use levelling compounds – complete with online game! Replacing the previous range of five floor levelling compounds, the new LX range is a game-changer in the marketplace and game-over for the competition. LX-40 Floor Leveller: self-levelling and smoothing compound for 2-12mm internal floors, which sets in 4 hours and is suitable for concrete floors. LX-200 Flex Leveller: flexible leveller for smoothing from a feather edge up to 20mm internal floors including over undertile heating systems. Sets in 3 hours. LX-360 Fibre Leveller, fibre-reinforced for improved flexibility and strength for levelling 3-60mm, on timber floors and over underfloor heating systems. Sets in 3 hours, no spike rolling means quicker installation. 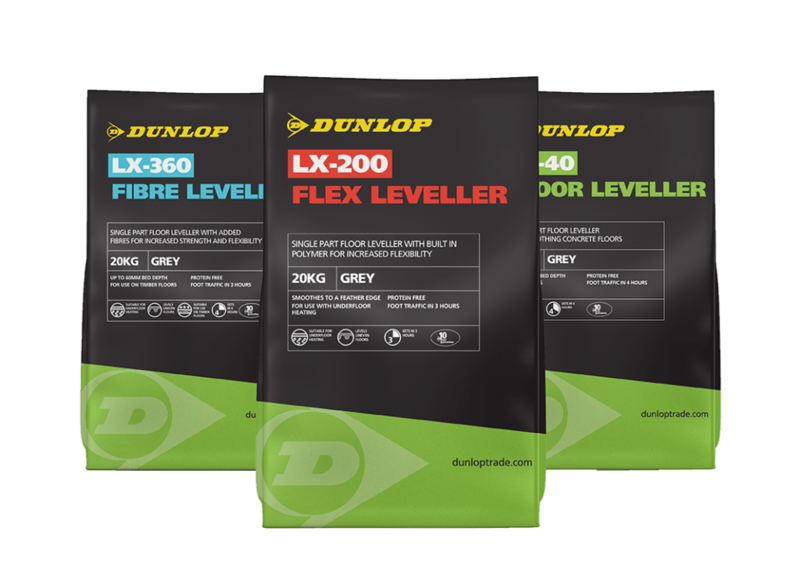 Available now in 20kg sacks and competitively priced, the new range fits effortlessly into Dunlop’s product portfolio including wall and floor tile adhesives, grouts, waterproofing, anti-fracture matting and sealants providing tradesmen and women with all they need to tile with confidence. Debi Boulton, Sales and Marketing Manager at Dunlop said: “The LX range of floor levellers provides tradesmen and women with a straightforward choice of three products, ensuring there is one for every flooring job whether it’s levelling over timber or underfloor heating, or smoothing from a feather edge right up to 60mm. “Easy to use, each leveller is self-smoothing with easy flow, self-healing properties and protein-free which eliminates the growth of bacteria. 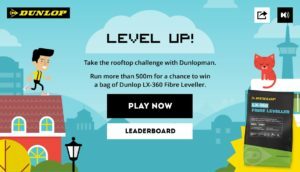 To celebrate the launch of the new range, Dunlop is inviting people to “Level Up” by playing its new online game at www.dunloptrade.com/levelup which gives tradespeople the chance to win a free bag of LX leveller*. The aim of the game is to make Dunlopman run further than 500m by jumping from rooftop to rooftop and dodging the obstacles. At the end of the month, those on the leaderboard will be entered into a random draw with the chance of winning a bag of LX-360 Fibre Leveller.